The GXP has upgraded bearings in this location from the factory, as it’s a high-load point in the suspension. The standard G8 and G8 GT's received rubber bushings in this location and the Super Pro polyurethane bushings are a great upgrade to decrease bushing deflection. These same bushings fit both the Outer Rear Trailing Arm and Outer Rear Lower Control Arm of 2008-09 Pontiac G8 models. Fits Rear Trailing Arm only for 2010-14 Chevrolet Camaro models. The GXP has upgraded bearings in this location from the factory, as it’s a high-load point in the suspension. 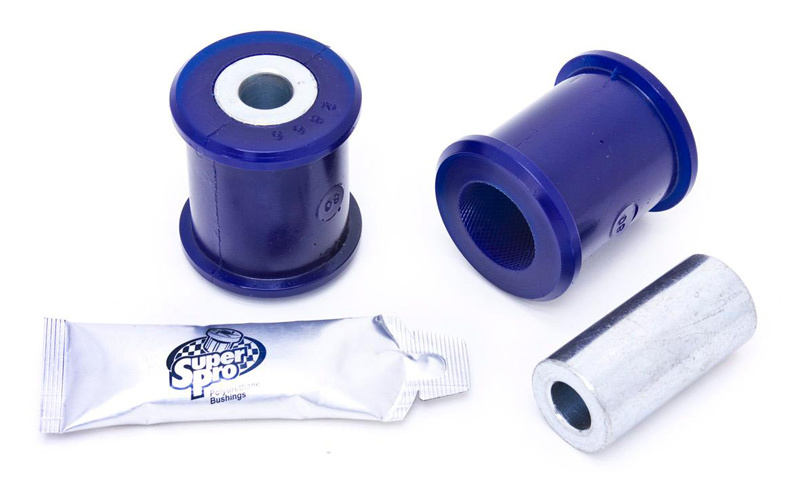 The standard G8 and G8 GT's received rubber bushings in this location and the Super Pro polyurethane bushings are a great upgrade to decrease bushing deflection. These same bushings fit both the Outer Rear Trailing Arm and Outer Rear Lower Control Arm of 2008-09 Pontiac G8 models. Fits Rear Trailing Arm only for 2010-14 Chevrolet Camaro models. Package includes two bushings, two sleeves and a grease packet. Interested in ordering some BMR Suspension Upgrades for your Pontiac G8 or Chevrolet SS or Camaro? Call ModBargains at 714-582-3330 to make an order today!